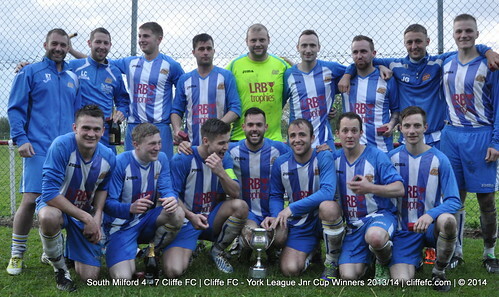 Cliffe FC complete a superb cup treble by retaining the York League Junior Cup, beating South Milford 7-4 in an 11-goal thriller. ~ Keith Tiplady, 13th May 2014. A cold and wet first half, the rain soaking both player and brave spectators, began with Cliffe opening scoring within the first 60-seconds, Kevin Taylor crossing to Si Houlder who controlled the ball and put it past the ‘keeper to make it 1-0. Andy Addison doubled Cliffe’s lead, pouncing on a loose ball to finish left-footed past the ‘keeper, 2-0. Cliffe further extended their lead, Chris Jackson being dragged down in the area – Jackson scored the spot-kick to make it 3-0 near the half-hour mark. Milford grabbed a goal to make it 3-1 before Cliffe restored their 3-goal cushion, Jackson breaking the offside trap and lobbing the ball over the on-rushing ‘keeper, 4-1. Milford scored another goal to make it 4-2 as the goal-fest of the first half continued, Tom Hogg forced a defensive error and smashed the ball past the ‘keeper to make it 5-2. Hogg then assisted Houlder, Houlder tapping in his second of the game for 6-2. South Milford made it 6-3 at the break, pouncing on a Wes Pears slip and neatly lobbing the ball over Dave Laverack, 6-3 HT. The second period didn’t match the goal-fest of the first-half but South Milford attempted to make a game of it and scored the first goal of the half, to make the score 6-4. Taylor saw a cross/shot from a tight angle tipped onto the bar and Ryan Sedman was called into action at the other end, clearing the ball off the line before Jackson completed his hat-trick, an emphatic right-footed finish to make it 7-4 – Jackson’s 40th goal in all competitions for Cliffe FC this season. 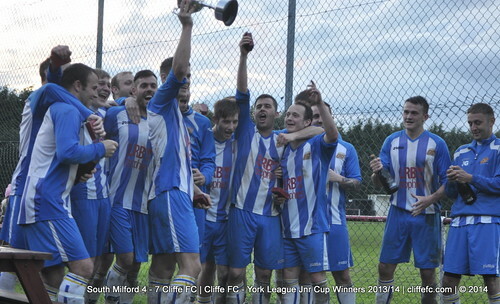 7-4 it remained until the final whistle and Cliffe FC retain the York League Junior Cup to go along side their York FA Cup and East Riding County Cup triumphs, not forgetting promotion to Division One. Cliffe FC now look forward to Saturday’s club trip to Blackpool, a deserved event to celebrate this season’s efforts. LRB Trophies South Milford MOTM: Colin Heath. Laverack, Sedman, Pearse, Durnin (Robinson), Pears, Beckram (C), Addison, Taylor (Edwards), Hogg, Houlder (Carter), Jackson. Unused subs: J Grundy, Harris. Cliffe FC Goals: Jackson (3), Houlder (2), Addison, Hogg.